As of Wednesday, Spotify customers have yet another device they can stream their songs to: The music subscription service is now available as a native app for the iPad. 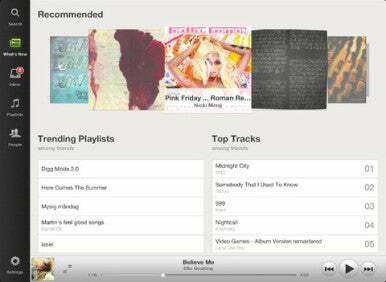 Spotify on iPad includes Retina-level graphics for displaying album art. Spotify launched Version 0.5.0 of its iOS app on Wednesday morning, expanding from an iPhone-only offering to a universal app optimized for all iOS devices running iOS 5 or later. The app continues to give listeners access to millions of tracks of music, even when they’re offline, and can be played wirelessly on stereo systems using your iOS device’s AirPlay capabilities. The upgrade also includes Retina graphics for both interface and album art. Other upgrades to the app include gapless playback and crossfading; bugs that caused the app to crash while updating playlists or starring song tracks have also been fixed. Spotify's mission in the app is to expose you to new music, though it's happy to play songs you already know and love. The iPad version of the app's opening screen features a row of music recommended for you in the form of album covers. Below that are the most-played playlists and songs from Facebook friends who are also using Spotify. Scroll down, and you'll see new music releases and the top playlists and song tracks for your area. 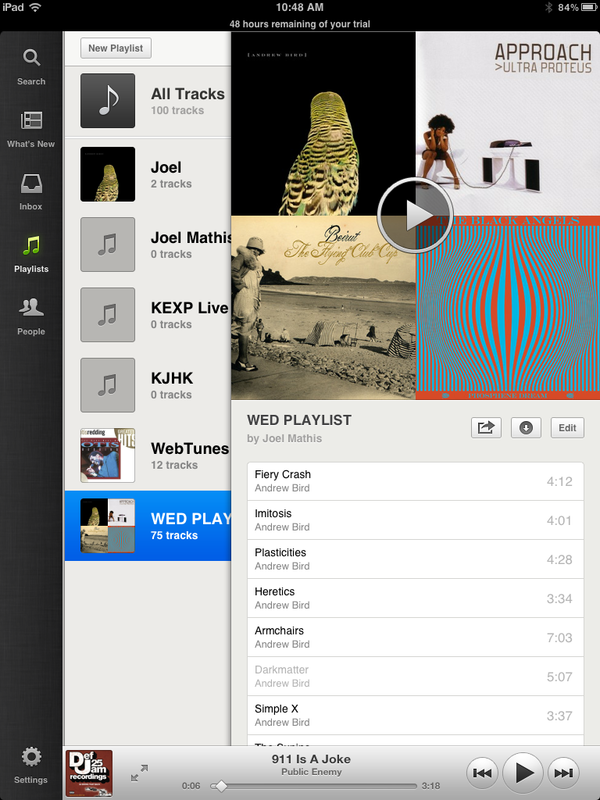 Spotify's iOS app imports your iTunes playlists for editing, playing, and even listening offline. In addition to your subscription tunes, Spotify for Mac syncs with your computer's iTunes account, bringing over the songs you own and the playlists you've created there. That syncing carries over to the iOS app—if you created a playlist in iTunes, you can see, play, and edit it on your iOS device within Spotify. You can also designate specific playlists for offline listening. The iPad app is actually slightly easier to navigate than Spotify's Mac application—settings for sharing your music to Last.fm and Facebook are easy to find and use. You can also choose to share individual tracks to Facebook, Twitter, or email—and the app includes an inbox where Spotify-using friends can share music with you. While the app is free, you’ll need to be a subscriber to Spotify’s $10-a-month premium service to use most of the app's features, including—most importantly—listening to music on your iOS device. If you're a free user, you can still use the app locally to wirelessly run the Spotify application on your Mac, allowing you to remotely play tracks and edit playlists. The Spotify app is compatible with all iOS devices running iOS 5.0 or later.